"This savory and satisfying one-pot meal is quick to make and devoured even faster! Great as a vegetarian entree or pairs well with any protein. Wonderful creamy texture without adding butter or cream. This will find its way into your weekly rotation!" Heat olive oil in a large skillet over medium heat; cook and stir onion, eggplant, zucchini, mushrooms, salt, and pepper until onion is translucent, 5 to 7 minutes. Add tomatoes, garlic, and basil; cook and stir for 2 minutes. Pour vegetable stock into the skillet; bring to a boil. Add couscous, stir well, and cover skillet; simmer until couscous is tender yet firm to the bite, 7 to 10 minutes. Stir tomato oil into couscous mixture and top with Parmesan cheese. See time-saving tips for a quick-and-easy chicken penne pasta dinner. 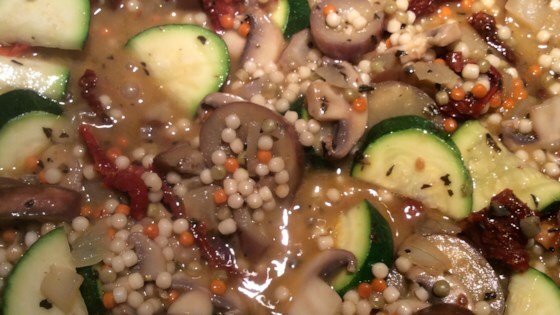 If your couscous is too al dente in Step 2, you can add a splash of stock and simmer an additional 2 minutes.